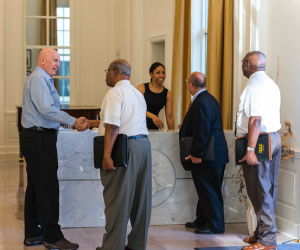 The Scientology Information Center hosts regular events and receptions for members of the community. The center is open daily from 10am-10pm and requires no appointment to visit. CLEARWATER, FLORIDA, US, February 7, 2019 /EINPresswire.com/ — On Saturday, February 2nd the Church of Scientology Information Center, in downtown Clearwater hosted a reception and showing of the independent documentary film, Nicky’s Family. The film was streamed live from the Scientology Television Network to remember those whose lives were lost during the Holocaust. The United Nations named January 27th as the day for member states to honor the Jewish victims of the Holocaust and millions of other victims of Nazism. It marks the date of the liberation of Auschwitz by the Soviet Union and the end of the Holocaust in 1945. Nicky’s Family, a documentary by award-winning filmmaker and peace advocate, Matej Mináč, has garnered over 30 awards worldwide. Nicky’s Family depicts the true story of Sir Nicholas Winton’s rescue of hundreds of Czechoslovakian Jewish children during the run-up to World War II. Sir Winton’s acts of kindness went unknown, until fifty years after the war when his scrapbook of the children’s photos was found and his amazing story gained worldwide attention.